Whenever I visit a new city I like to walk around its downtown, breathing in both its history and contemporary look. What was, f or example, once a bank made of brick or stone is now a pizza parlor or a pub. There are always a few buildings that also house antiques of every kind and although I’m not usually interested in most of the items in these stores, I do look for something that might have a unique story. I know I’m probably not going to find some lost painting, baseball card, or photograph worth millions. I went into one of these local antique stores and moving gingerly through its web of glassware, tools, furniture, kitchen utensils, sport memorabilia, toy cars, cases of military buttons and badges, several collections of Life magazines, vinyl record, and an occasional empty guitar case. With few exceptions most of the items were overpriced. Still, walking through one of these antique places often becomes a brief journey of one’s own past and memories. It’s not uncommon to hear someone say “We had one of these.” So, perhaps, if nothing else, antique stores help people to reconnect with their past, especially memories of where and how they grew up, and moved through life. I was about to leave the store when I came across an interesting wooden box. This one struck me right away as being different. First of all, it had a lot of printed artwork on it. Second, it was a box used for shipping its product from Washington D.C. Third, and I knew this right away, it wasn’t just a unique box, it came with a story too. After all, Conroe, Texas is 1,411 miles away from where this box originated. 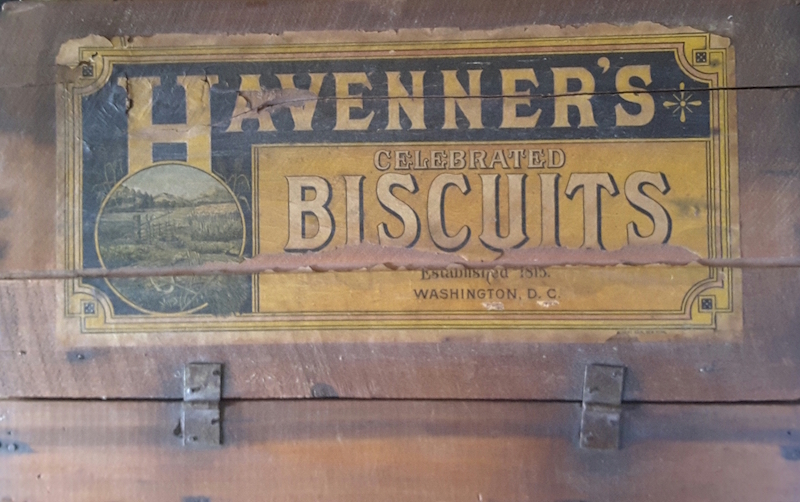 I knew I would never be able to find out how it got to Conroe, but I became interested in the history of the company’s name on the box: Havenner’s Celebrated Biscuits Established 1815 Washington, D. C.
I didn’t think I’d found an original box dating back as early as 1815, but, examining the hinges on its top, the colorful imprint on it, and the wood itself, it was probably a genuine box used by the company to ship its biscuits in its later years. Moreover, this company, I discovered, was no small local bakery. The company, established in 1815, in the heart of the Capitol, employed a hundred bakers and workers. Three brick ovens produce upwards of fifteen thousand loaves of bread daily. The ingredients were mixed by steam powered machinery. Through a fleet of 23 wagons it supplied grocery stores, hotels, restaurants, and families within a hundred mile radius. I imagined that it might also have produced bread for the president’s home. In all likelihood it did. I bought the box for one-hundred-twenty-five dollars. On some sites, similar boxes from this company and depending on its condition sell for anywhere between four and seven hundred dollars. But that wasn’t important to me. I bought it because of its story, a memory of America. The company, founded in 1815 by Thomas Havenner, was located in several buildings along C Street NW, in Washington DC. After his death in 1871 his son-in-law, Benjamin Charlton, continued to operate the company into the early 1900’s. The company was eventually sold, underwent mergers, and was finally absorbed into the National Biscuit Company (Nabisco).